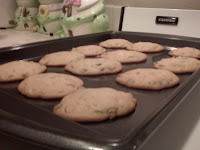 ..something beautiful...: Perfecting my cookie making skills. Perfecting my cookie making skills. Almost a year ago I was attempting to make pumpkin chocolate chip cookies from scratch. As I pulled my first batch out of the oven something was very wrong. They were flat as pancakes. Now we all know chocolate chip cookies are supposed to raise while they bake. Well these cookies did not. I could not figure out what I had done wrong. After a phone call to grandma we came to the conclusion to add more flour. Next batch looked exactly the same as the first, but tasted like a flour mill. What on earth had I done!? I went back over the steps one by one. I then looked at the recipe name and realized it said pumpkin bread, instead of pumpkin chocolate chip cookies. How I managed to pull this one off I have no idea. It was rather embarrassing telling my grandma and mom what I had done, but we all got a good laugh out of it in the end. I had a very kind and generous person in my life mow my yard last night. In appreciation I wanted to do some thing for him. What a better time to practice my cookie making skills! All in all i mastered a batch of cookies with out destroying them and having to throw them away. Tis going to be a wonderful day!